The dark Scorched Pine finish and clean lined construction brings unique rustic style to this dresser. 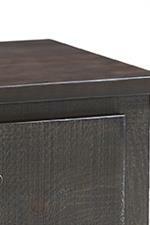 Its rough sawn distressed finish is contrasted by the smooth top to create the rustic feel of this piece. A final unique touch is added by the vintage luggage inspired handles found on the eight drawers of this dresser. The dresser's four deep drawers are spacious enough to hold all manner of bulky items. Meanwhile, the other four top drawers are perfectly sized for organizing socks and other sundries. The Brickyard Rustic Dresser with 8 Drawers by Progressive Furniture at AHFA in the area. Product availability may vary. Contact us for the most current availability on this product. The Brickyard collection is a great option if you are looking for Industrial furniture in the area.